You don't need to go to Denmark, France or Britain if you want to see medieval fotresses and palaces. You can just come to visit Bulgaria and see with your own eyes what an unscalable fotress means. 2 km south of the town of Asenovgrad, above the road to Smolyan stands the historical Assenova Krepost (Assen's Fortress), which had existed even during the Thracian ages. The earliest archaeological findings date from the time of the Thracians, the area of the fortress being also inhabited during the Ancient Roman and Early Byzantine period. The fortress gained importance in the Middle Ages, first mentioned in the statute of the Bachkovo Monastery where it was referred to as "the stronghold of Petrich" in the 11th century. During the Middle Ages the fortress was subject to large-scale construction work, the most significant part of which was done in the 13th century under Tsar Ivan Assen Р†Р†. An eight-line inscription in Bulgarian at the entrance of the fortress commemorates his glory. "In 6739/1231/, Indiction 4, Ivan Assen, by God's will Tsar of the Bulgarians, the Greeks and other peoples, installed Alexi Sevast here in power and erected this fortress". It was this inscription that encouraged people later to give Petrich Fortress a new name - Assen's Fortress and to rename the nearby town of Stenimachos Assenovgrad. The fortress became strategically important in medieval ages after the battle at Klokotnitsa (1230). Due to excavation works were discovered the fortress walls, the castle of the feudal lord and three water reservoirs. 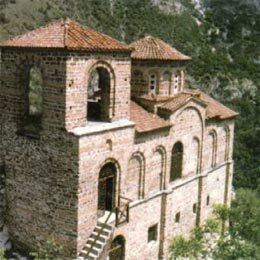 But the only preserved and most remarkable building in the fortress is a 13th-century church called St Mary of Petrich. It is two-storey, cross-dome, one-nave church with a wide narthex and a big square belfry above it. It is for the exquisite architecture, the plastic decoration of the south facade and the fragments of the inique 14th-century murals that this church is said to be one of the best examples of medieval architecture in Bulgaria. Taken by the Byzantines after Ivan Asen II's death, the fortress was once again in Bulgarian hands at the time of Ivan Alexander in 1344 only to be conquered and destroyed by the Ottomans during their rule of Bulgaria.